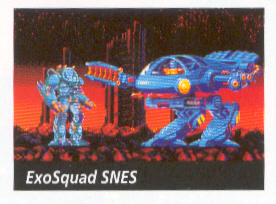 ExoSquad was released on the Genesis by Playmates. It is a futuristic action game based on a cartoon. This shot was taken from the German magazine Nintendo Fun Vision (issue 7). It appears that a snes version was planned, but subsequently axed.